Interesting but sometimes complex interacting processes cause differences in climate between more urbanized areas and nearby less urbanized areas. 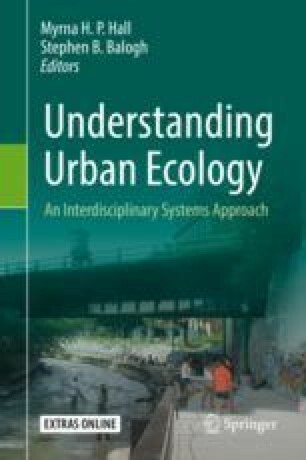 This chapter aims to provide an understanding of urban climate systems and the ecological significance of the differences between rural and urban climate. We include explanations of terms, units of measurement, and basic equations that are commonly used in the expanding scientific literature from urban climate research around the world. We describe the physical processes that govern energy balances of urban landscapes—human-caused heat input; modified solar and thermal radiation; transfer of sensible heat, which we feel as air temperature differences; and movement of heat by evaporation and condensation of water. The urban effects on energy transfer and the flow of air in the lower layers of the Earth’s boundary layer cause temperature differences between urban and rural areas known at the urban heat island (UHI) effect, which can commonly reach intensities of 10 °C. This effect is a main focus of the chapter. UHIs are altered by topographic influences that sometimes overwhelm urban land cover influences on air temperature. We describe types of UHIs and provide examples, the methods used to detect UHIs, and the influences of tree cover and parks. We briefly describe the effects of urban structure on wind, including thermally driven flow. Finally, we relate urban climate to global climate change and explore some of the difficulty of separating urbanization influences from global climate change. The online version of this chapter ( https://doi.org/10.1007/978-3-030-11259-2_7) contains supplementary material, which is available to authorized users. The first author thanks the many students and technical support staff who assisted with research on urban forest climate influences, including Karla Hyde, Yingjie Wang, David Murphy, Greg Bacon, Michelle Bunny, Andrew Lee, Emma Noonan, and Hang Ryeol Na. GIS maps were prepared by Alexis Ellis. The Baltimore Ecosystem Study LTER, operating with contributions from the National Science Foundation grant DEB 0423476, provided some of the instrumentation and technical support staff. This chapter was improved by suggestions on an earlier draft from Nancy Selover, Arizona State Climatologist; Ian Yesilonis, Soil Scientist, USDA Forest Service; and Jacqueline Lu, Director of GIS and Analytics, NYC Parks.